Yep, you read that right. Since Nathaniel is busy partying with the Dallas Cowboys this New Year's Day (that, or working on side projects--I forget which one he said he was doing), I figured I should play the role of good blogging buddy and make some resolutions on his behalf. And, boy, does he need to have some things resolutioned. Um, resolved. Like, fer instance, he needs to read more Goon comics by Eric Powell. I mean, sure, I've been promising to lend him the last three volumes of the series since the summertime, but c'mon! Show some initiative and just steal them from my home when everyone's asleep and/or partaking in the "wine tasting" tour of my neighborhood! Jeez. What kind of comics fan are you, anyhow? 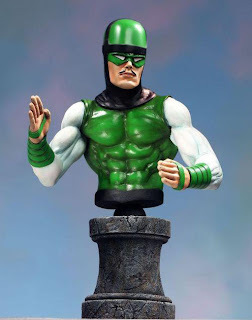 On that subject, you need to resolve to buy more of those expensive comic book character statues. I've seen your Dorky Lair, and it is utterly devoid of expensive comic book character statues. Rectify that in the New Year. Oh! And that leads me to my next resolution for Nathaniel. Be more vocal about hating things. That's what real comics fans do. Let's face it--you've been reading comics for just over a year now. I'd say the time is long overdue for you to join the vocal Internet minority of crazies out there. You need to get on the Newsarama boards as soon as possible (with some ridiculous handle like I Am Odin's Beard 1984) and start yelling at creators for creating things. Speaking of beards, it's well past time for you to shave a Bat Symbol on the right cheek and a Superman shield on the left cheek. (And, just so's I'm clear on this, we're talking the face here, people.) Most rabid fanboys would kill for facial hair like that! 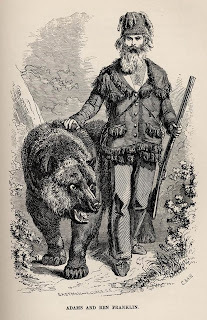 And speaking of Grizzly Adams, this is the year when you finally go back in time and kill Grizzly Adams. You invented that look. Not him. And he should pay for that. Just look at that guy! How pompous can he get?! Walking around with a bear all over the place, thinking he's so cool. There's just no learnin' some people. Speaking of learnin'...this is the year in which you resolve to make Alex learn how to do all that fancy HTML wizardry you're always doing on the blog. Sure, it looks like black magic, but how else is a guy gonna make snow fall on a blog? And, finally, this is the year in which you resolve to buy your best buddy Alex a near mint copy of Daredevil, issue one. Lots of work to do, Flashman. Lots of work to do. And, with that bit of nonsense out of the way, we here at Exfanding Your Horizons want to wish you all the Happiest New Year ever! Here's to a better 2010!